Xinjiang Magic Deer (WCBA) strengthened their roster with addition of 28-year old Bahamas center Waltiea Rolle (198-90, college: N.Carolina). She is the second import player in the roster as USA Natasha Howard signed here earlier. Rolle played most recently at Edremit in Turkish TKBL. In 17 games she recorded 14.6ppg, 9.6rpg, 1.7apg, 1.1spg and 1.9bpg last season. The previous (16-17) season Rolle played at Haskovo 2012 (NBL) in league where in 21 games she averaged 13.9ppg, 12.3rpg (leader !!! ), 1.0apg and 1.9bpg. She helped them to win the Bulgarian League title and the cup. Great season indeed as she was voted to Eurobasket.com All-Bulgarian League 2nd Team and League Player of the Week (2 times). In 2013 Rolle was drafted by Minnesota Lynx (WNBA) in third round (36th overall). She attended University of North Carolina and it is her sixth season in pro basketball. The list of the past achievements is quite long as among others Rolle received Eurobasket.com All-Czech Republic D1 Defensive Player of the Year award back in 2015. She has played previously professionally in WNBA (Seattle Storm) and Czech Republic (Basketball Nymburk). UMMC Ekaterinburg (PBL) added to their roster 24-year old Bahamas ex-international center Jonquel Jones (198-94, college: G.Washington). 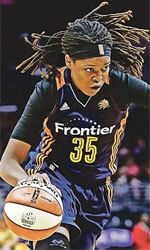 She played last summer at Connecticut Sun (WNBA). In 35 games she recorded 11.8ppg, 5.6rpg and 1.8apg. A very spectacular season in her career as she was selected WNBA Sixth Woman of the Year. The most of last season Jones spent at Xing Rui in league where in 33 games she was second best scorer with impressive 28.8ppg and had 18.3rpg (leader !!! ), 2.9apg, 1.5spg and 1.8bpg. She helped them to make it to the final. Great season indeed as she was selected Asia-Basket.com All-Chinese WCBA Player of the Year, Import of the Year and voted to 1st Team. Jones also spent pre-season at Fenerbahce in Turkish league. Two years ago she was drafted by Connecticut Sun (WNBA) in first round (6th overall). The former George Washington University standoutis in her third season in pro basketball. The list of the past achievements is quite long as among others Jones won Korean WKBL championship title in 2017. She was also voted Asia-Basket.com All-Korean WKBL Player of the Year in 2017. Jones represented Bahamas at the CBC Championships for Women in Tortola (British Virgin Islands) four years ago. Her stats at that event were 5 games: Score-2 (17.2ppg), Reb-1 (14.0rpg), 2.0apg, 1.6spg, 1.4bpg, FGP: 37.5%, 3PT-2 (50.0%), FT: 64.5%. Jones has played also professionally in Korea (Woori Bank). The Bahamas women's national basketball team finished fifth overall at the 2018 Centrobasket Championships in Puerto Rico yesterday. In its final game of the tournament, team Bahamas knocked off Costa Rica for the second time, picking up a 55-49 win. Brea Forbes (173-G-94) led The Bahamas with a game-high 16 points. Tracy Lewis (180-F/G-90) added 13 points and Leashja Grant had 10 points, eight rebounds and three assists in the win. Jennifer Sanchez had 13 points on 5-10 shooting for Costa Rica. Team Bahamas finished the tournament with a 2-2 record, dropping its first two games to Puerto Rico and Mexico respectively. 'I want to thank all of the women that came out to represent the country at these championships,' said Bahamas coach Wayde Watson . 'The next time we come out to represent the country, we'll have to field a better team. I say that not to disregard the players we had by any means, because I asked a lot of them and they answered. However, this is not our best 12. We need our best players if we want to have a chance to win at these kinds of tournaments.' Forbes added: 'To see the ball go through the net was a great feeling, especially since I missed so many in the first two games. I felt like the first game against Costa Rica was a confidence builder and I was able to build on it. This was my first senior Centrobasket, and although I wish we could medal or qualify, I am pleased with our effort here.' Team Bahamas played out of Group B in the tournament, along with Mexico, Costa Rica, and host country Puerto Rico. Group A was made up by Guatemala, Cuba and the Dominican Republic.